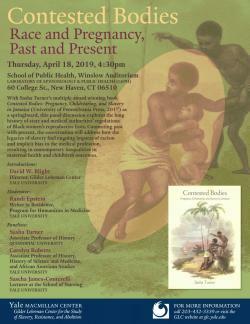 Home > Calendar > GLC Panel Discussion: “Contested Bodies: Race and Pregnancy, Past and Present"
If you register, please arrive early. At 4:30pm we will open up seating to all. Metered, on-street parking in the area is available but limited. Very limited guest parking (for a fee) is available in lot CP2 (past 47 College street). Off-street parking is available at the Temple Street Garage (1 Temple Street) the Air Rights Garage (60 York Street), and the Howard Avenue garage (790 Howard Ave). From any of those garages it is a 10 minute walk to the School of Public Health. Please give yourself extra time to walk to venue. The Yale Shuttle (blue line) is another option.